ParklandGEO has been involved in over 1000 materials testing and construction quality control projects in Alberta since 2000. We have monitored and supervised all types of construction, including large scale multimillion dollar industrial projects and numerous highway projects for Alberta Transportation. 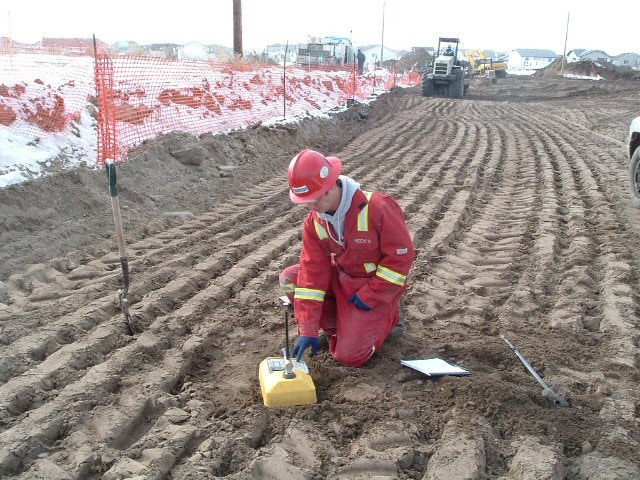 Our CSA certified technicians and technologists are very experienced in concrete testing (air and slump), proof-roll testing and reporting, density/moisture testing, footing and pile inspecting, field QA/QC monitoring and supervising, and asphalt testing. We have three fully equipped laboratories in Alberta capable of in-house routine concrete and asphalt testing, including compressive strength testing, standard and modified proctors, grain size distribution (sieve and hydrometer), and asphalt quality control (flow, stability, bitumen and density). Our high end soils laboratory can also perform direct shear testing, hydraulic permeability testing, California Bearing Ratio (CBR), unconfined compression and consolidation testing. ParklandGEO strives to provide a service to clients that offers both support and assurance in the quality of the materials used on projects, where any concerns or issues are addressed and dealt with promptly and efficiently. This has resulted in strong client relations and a notable reputation for services provided in this field.